Two PricewaterhouseCoopers Accountants Responsible For The Academy Awards ‘Best Picture’ Blunder Are OUT Never To Work The Show Ever Again…WOW!! The Academy Awards ain’t going down without some heads rolling in what is the worst mix-up in Academy history. Hmmm..we wonder how Steve Harvey feels about the blunder considering he experienced something very similar. Ok that was a low blow…however the accounting firm PricewaterhouseCoopers is definitely taking ownership of the situation. The two accountants who were responsible for the envelopes will be removes from ever working the Oscars ever again. Some would say this is quite harsh but considering the level of embarrassment the Academy has endured as well as the obvious losers of the Oscar, the measure taken is an appropriate one. The powers that be at the Academy Awards has vowed this will never happen again. The president of the film academy says the two accountants responsible for the best-picture flub at Sunday’s Academy Awards will never work the Oscars again. She also laments that the error overshadowed a show that celebrated a rich diversity of talent and storytelling. 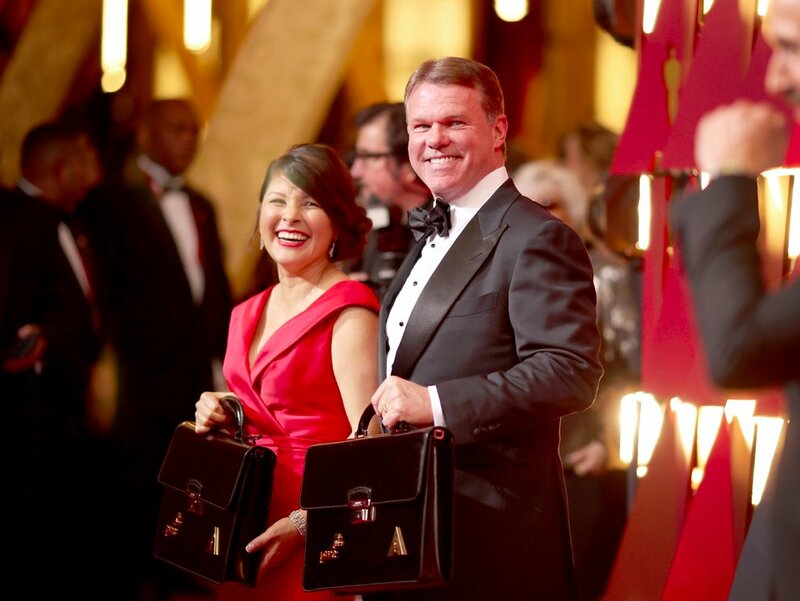 The academy president told The Associated Press that Brian Cullinan and Martha Ruiz, the PwC accountants who handled the winners’ envelopes at Sunday’s show, have been permanently removed from all film academy dealings. While Cullinan was responsible for handing over the errant envelope that led to “La La Land” mistakenly being announced as best picture rather than “Moonlight,” PwC said both partners failed to follow protocols and did not act quickly enough to catch the error. The Academy of Motion Picture Arts and Sciences’ relationship with PwC, which has been responsible for tallying and revealing Oscar winners for 83 years, remains under review, Boone Isaacs said. Cullinan was distracted backstage, she said. He tweeted (and later deleted) a photo of Emma Stone in the wings with her new Oscar minutes before giving presenters Warren Beatty and Faye Dunaway the wrong envelope for best picture. PwC released a statement late Sunday and another Monday taking “full responsibility for the series of mistakes and breaches of established protocols” during the Oscar show. “Once the error occurred, protocols for correcting it were not followed through quickly enough by Mr. Cullinan or his partner,” the statement said. Both partners remain with the company, a PwC spokesman said Wednesday. Though the academy released a statement late Monday apologizing to the artists of “Moonlight” and “La La Land,” Boone Isaacs said she waited to say more until her team had a better understanding of what led to the error. She commended show producers Jennifer Todd and Michael De Luca, presenters Beatty and Dunaway and host Jimmy Kimmel for handling the unprecedented situation so gracefully. She also lauded “La La Land” producer Jordan Horowitz, who she said “went from a nominee to a winner to a presenter” in a matter of minutes. Still holding the Oscar, he thought he’d won, Horowitz was the first to announce that “Moonlight” was the actual best picture recipient. “It’s important to remember that that is what this is all about,” she said. Also on Wednesday, the academy addressed another embarrassment on Sunday’s show, apologizing to the Australian movie producer incorrectly shown during the in memoriam segment. In a statement, the academy extended “our deepest apologies” to producer Jan Chapman, whose photo was mistakenly used in the tribute instead of Chapman’s colleague and friend, the late Janet Patterson. Chapman had said she was “devastated” by the error. Boone Isaacs said she regrets that the best-picture flub has overshadowed the show and its diverse array of winners. After two years of “OscarsSoWhite,” with all white acting nominees, Sunday’s ceremony recognized several actors and writers of color, and named a tender film about a gay black boy best picture. It followed two years of extensive reform to improve inclusion within the academy. And though she’s ready for public attention to shift back to the winning films rather than the errant envelope, Boone Isaacs appreciates that so many people care about the Academy Awards.